In the war of the worldviews, it’s easy to dehumanize the enemy. Opposing sides remain unwilling to compromise, convinced their position is the right one. This tactic all too often finds its way into conversations about creation and evolution. Christians are not immune to defending our ground so uncompromisingly that we refuse to listen to the opposition, even if the opponent is on the same side of the fence. The battle over human origins comes to mind as scientists and Christians with varying perspectives on creation seek to defend the truth as they see it. Meanwhile the infighting between the faithful continues. But there are peacemakers among us. Trained scientists who hold a high regard for Scripture and are not quick to condemn others. In his book, The Adam Quest, Christianity Today senior writer Tim Stafford profiles eleven such scientists (among them, RTB’s own Fazale Rana) who he views as standing bravely at the edge of the battlefield and the rhetoric. These explorers, he calls them, embark on a journey to discover who we are and where we come from. By sharing their journeys, Stafford hopes to humanize the “Adam quest.” For good reason, too. As Stafford sees it, “Today’s polarized environment produces less dialogue, more sound bites.” (We can only hope the upcoming debate between Ken Ham and Bill Nye doesn’t fit this bill.) Stafford challenges believers not to focus on proving the other side wrong, but to seek to understand those with whom we disagree in an effort to gain mutual understanding. Here’s where it might be tempting to cut ourselves out of the conversation entirely in favor of simply trusting that God’s Word is true, no questions asked. Yet Christians’ reluctance to delve into such topics can impede evangelism and even cause believers to walk away from the faith as scientific challenges remain unanswered. Stafford saw this play out with his own son. Stafford makes the point that when human societies turn their backs on knowledge of the outside world, they stagnate, and “stagnant societies can’t fulfill their God-given destinies.” For the eleven scientists, their destiny is to bring the two sides together. Science and faith living together in perfect harmony. 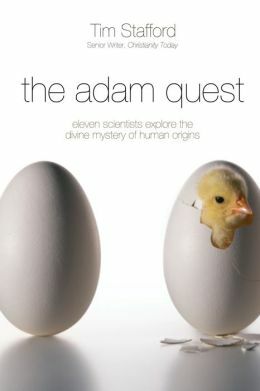 The Adam Quest begins with profiles of young-earth creationists Kurt Wise, Todd Wood, and Georgia Purdom. The intelligent design camp follows with Michael Behe and Fazale Rana. (To clarify, Rana sees his views on creation as distinct from intelligent design.) Rounding out the bunch are evolutionary creationists Mary Schweitzer, Darrel Falk, Ard Louis, Denis Alexander, Simon Conway Morris, and John Polkinghorne. Stafford’s narrative paints a picture revealing the spectrum of Christian beliefs on creation and evolution. But along the way he made clear his approach to engaging the eleven: get out of the way and let them tell their stories. That seems to be an important step when treading into conversations about science and faith. Let the other person talk. You might be surprised by what they have to say. And when it’s time to respond, keep Stafford’s words in mind: “The truth of Scripture is fundamental….But so is the truth, frequently witnessed to in that Scripture, that all true Christians are part of the body of Christ. Absolutely! In today’s culture those who oppose us (or hold to different views) are to be vanquished…take no prisoners! Politics, religion, worldviews, business competitors–you name it. When we debate we tend naturally to argue, most commonly by spotlighting our opponent’s weaknesses, leaving out their most credible points, and failing to acknowledge our own shortcomings. Not a very biblical pattern for loving our fellow man. One of the things that really impressed me about RTB when I took your Creation and the Bible course was that you genuinely tried to fairly and accurately represent opposing viewpoints. It was so refreshing–not propagandized or slanted, just laid out for consideration. It was the “gentleness and respect” of 1 Peter 3:15, and it was a powerful apologetic in itself. As Bobby Conway teaches, apologetics is about removing obstacles, not defeating opponents. Truth be told, none of us have it all figured out. Thanks for this great post! Thanks for your kind words, John. I’ve passed your comment on to the staff as I’m sure they’d be blessed by it. We’ll be sure to check out Clark Morledge’s series (feel free to post a link to nudge us along).